“Ninety-five Percent Safe” by Caroline M. Yoachim is an Asimov’s Science Fiction magazine Readers’ Awards Finalist in the short story category. It was originally published in Asimov’s January 2015 issue. Currently, this story and most of the other finalists are available to read for free on the Readers’ Awards Finalists page at Asimov’s. Loved it. It’s going to be difficult to choose a winner from the marvellous stories I have read so far for the Asimov’s Readers’ Award. This tells the story of a future earth, where people live overcrowded under domes to protect them from the nuclear winter. Many are travelling through wormholes to colonise a new planet. One young girl wants to follow her friend there but her mother doesn’t want to take the risk. Five percent of people don’t make it through the wormhole. Can’t tell you any more. What did I learn? That I will never be good enough to compete with this quality of storytelling. Oh well, I’ll just have to keep practising. First published in the March 1986 issue of Isaac Asimov’s Science Fiction Magazine. I read it in the collection The Legend Book of Science Fiction, edited by Gardner Dozois and published in 1991. I enjoyed this. But I don’t know why. The protagonist is unnamed, although he uses several names through the story. He may be from the future, is immortal, or that is suggested, there are others like him. He travels through America committing apparently senseless murders and other crimes, but doesn’t seem to be handling it very well. The story is compelling, very well written, and you are pulled through it by a desire to know who or what he is. Perhaps he is a librarian from Toronto called Gerald Spotsworth. I very much want to read more John Kessel after reading this story. It has shown me that it is okay to be daring in your writing, and to take risks. “Green Gifts” by Nick Webb was first published in 2014 in The Telepath Chronicles. I read it in the collection The Future Chronicles – Special Edition. Not normally my kind of fiction, but I enjoyed this. It is part of a larger body of work, which is probably the only downside to an anthology like this — it is basically advertising for the authors’ other works. However, that does not in any way belittle the stories in the anthology — I have mostly been impressed with the storytelling. This is a story about either a sentient telepathic planet or sentient telepathic original occupants of a planet that has been colonized by humans from Earth. Some of the humans have a relationship or affinity with the planet (or the original inhabitants). There are three protagonists, and the story is split into three smaller stories, all with similar outcomes. I am not sure what the outcome was, but maybe I wasn’t paying attention. My only criticism is that there are too many commas, or the style is too choppy, and it made it a little difficult to read. I am so tired from a long and late night doing a clean install of Windows 10 that I can’t write much. This is probably the last Maupassant story I will write about on this blog. I chose it tonight because it is quite a short short story. About a man who hankers after a medal to wear around town, like so many other people he sees. Almost everyone of note seems to wear one. So it is a story of obsession with trivial matters, which means he takes his eye off what is important. I liked it, but it is a similar formula to many of Maupassant’s shorter morality tale type of short story. 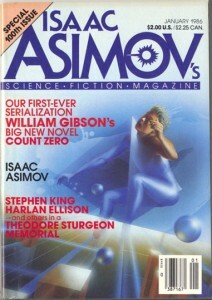 “Pretty Boy Crossover” by Pat Cadigan was first published in the January 1986 edition of Isaac Asimov’s Science Fiction Magazine. I read it in the collection The Legend Book of Science Fiction, edited by Gardner Dozois and published in 1991. A wonderful story. This is about a party goer, a Pretty Boy, who is only interested in being noticed while he is still young. He wants to dance and be with Bobby, who is also a Pretty Boy but one who has transitioned to bits and bytes and is now preserved as a Pretty Boy. The style was a little difficult to get into at first, but a lot of science fiction can be like that. But once you adjust to the style it doesn’t get in the way any longer. It was interesting in how it was constructed. We started in a club with dancing, then moved to a discussion in an office of the process and the opportunity for the protagonist to transition to this new form of existence, then back to the club. The style changes between the club and the office. In a novel, you might feel a little cheated if you got used to one style and the style changed half way through, but I think this can work a lot better in short form fiction. “Salvador” by Lucius Shepard was first published in The Magazine of Fantasy and Science Fiction, April 1984. I read it in the collection The Legend Book of Science Fiction, edited by Gardner Dozois and published in 1991. Brilliant. Lucius Shepard can write short stories, in case this wasn’t obvious, and is probably one of the best science fiction short story writers out there. This is the story of a US soldier in Salvador who takes drugs to improve his killing ability. Many strange things happen to him. Shepard has shown me in this one story some of the techniques of increasing the readers investment in and sympathy for a character. The characterization is great, and this is a story I will go back to for pointers on how to do it. I will be looking for more Lucius Shepard short stories, and perhaps even his novels. I have read a few over the years but not enough, and many of them are worth a re-visit. I read “Iteration” by Deirdre Gould in the anthology The Future Chronicles – Special Edition. I don’t think it has been published elsewhere, previously. This will be a very short post because there isn’t much to say. It was an entertaining story, amusing in places, a big idea, but overall it didn’t really work for me. It struck me as well-written, well thought through, but the story did not feel original. It seemed like a wish-fulfilment kind of story. There isn’t much I can learn from this story, I feel, although it deserved to be in the anthology. “My Time on Earth” by Ian Creasey is an Asimov’s Science Fiction magazine Readers’ Awards Finalist in the short story category. It was originally published in Asimov’s October-November 2015 issue. Currently, this story and most of the other finalists are available to read for free on the Readers’ Awards Finalists page at Asimov’s. It is the story of a young girl who visits Earth with her parents, and after a ghost tour in York she has a ghostly encounter where the ghost asks her to take his “anchor” with her to her home planet so that he he can see somewhere different. Of course there is more to it than that, and the tale twists a couple of times. A simple story, nicely told. I probably would vote for this as a winner but it was worthy, nevertheless. It is told by the girl to her friends in the dark, and she interjects into the story occasionally to make comments. A useful technique to keep in mind. I had decided not to mention any more Guy de Maupassant stories because there isn’t much to say about them. They are mostly perfect short stories in the sense that they are short and compact and can’t, on the whole, be summarized. However, I do intend to complete the selection in Selected Short Stories because I like to finish books and I am enjoying most of the stories immensely. “In The Bedroom” is marvellous. A story of marital infidelity, prostitution (again), and a wife getting the upper hand. What else can I say? It is about a man who objects to his wife seeking other lovers just because he has had an affair, or affairs. She proposes to charge him to sleep with her, at the same monthly rate that he spends on average on one of his mistresses in a month. First published in Omni, September 1981, I read “Going Under” by Jack Dann in The Legend Book of Science Fiction, edited by Gardner Dozois. It’s difficult to say much about this story without giving it away. It is set on the Titanic, and that is really all I can say. I thoroughly enjoyed it. It is science fiction and it is set in the future, and it is a great idea and a great story.